Even though autumn means the end of consistent sun and warmth in Michigan, at least we have the changing leaves and their breathtaking vistas of color to enjoy as we say so long to summer. In fact, Michigan is routinely one of the most-ranked states for “best-of” color tours by such sources as Fodor’s Travel, USA Today, and others. To help you choose the perfect path for your fall color tour charter, here are three exceptional areas in the state for fall color and more. In autumn, every road you drive down in the U.P. offers eye-popping color. To narrow down the options, UPtravel.com has mapped out great tours ranging from 90-220 miles. For example, Fall Tour 10, the tour nearest the Mackinac Bridge, begins in St. Ignace and moves north to Sault Ste. Marie, which is celebrating its 350th anniversary in 2018 and has plenty to see and do in the fall. Next, it’s south to the picturesque towns of Pickford, Goetzville and Detour Village at the most eastern tip of the U.P. where the St. Mary’s River connects with Lake Huron and the Straits of Mackinac. From there, head west through the Great Waters region of the U.P. Make some stops in Cedarville and Hessel, home of the nationally-known Les Cheneaux Islands Antique Wooden Boat Show, before returning to St. Ignace. This 150-mile color tour is just one of many U.P. color tours to choose from. Keep in mind that peak color in the U.P. is usually the last week of September through the second week of October. Manistee County knows how great its autumn is and folks there have already prepared fall tours your charter group can take, complete with detailed, downloadable maps. Check out each of the four self-guided fall color tour options that await. The always-popular and breathtaking Lake Michigan Coastal Tour along M-22 was named the Best Scenic Autumn Drive in the USA by USA Today in 2015. The tour takes you north along the Lake Michigan coast from Manistee through Frankfort, Empire, Glen Arbor and Leland, all the way to Northport near the tip of the Leelanau Peninsula, then south through beautiful Omena and Suttons Bay to wonderful Traverse City. You will see some of Michigan’s best through every one of the 150 miles and enjoy many opportunities to stop, shop, eat and enjoy autumn’s splendor all around you. For a shorter tour, try The Manistee River Valley Quilt Tour, a picturesque trip that winds its way for 30 miles through the countryside past historically significant quilt patterns displayed on the sides of barns and other structures amongst the glory of the valley’s autumn leaves. Or maybe you’d prefer the Inland Fall Tour that travels Manistee County for 150 miles through towns like Wellston, Mesick and Thompsonville, with potential stops at wineries, distilleries and historic spots where you can learn more about our state. Finally, for a blend of coastal and inland sites, the 125-mile Coastal Fall Tour offers a little bit of everything from farm markets to Arcadia Bluff’s overlook to cideries and wineries. 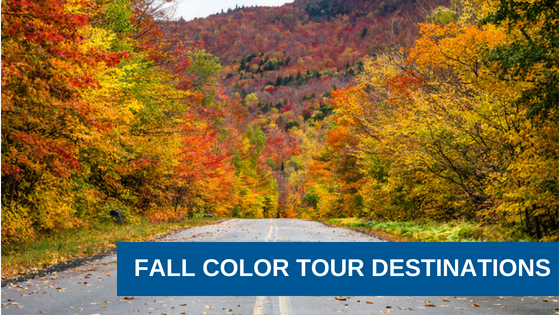 If your group wants a beautiful and fun color tour, you can’t go wrong with Manistee County. One of Michigan’s most beautiful and bountiful areas is the southwest corner, from New Buffalo to historic St. Joseph and north to quaint South Haven. Thanks to swmichigan.org, your group can enjoy a preplanned three-day color tour starting out on the West Michigan Pike, the state’s first continuous paved road; it was completed in 1922 and stretches all the way from the Indiana state line to Mackinaw City at the tip of the mitten. The area not only has Lake Michigan shoreline and beaches with massive dunes and bluffs, but also a long history of hospitality manifested in the many shops, bakeries, restaurants, fairs, and festivals. The entire area is full of fruit, from rolling hills of apple, pear and peach orchards to vineyards brimming over with grapes for a variety of wines. There is also plenty of natural splendor to enjoy at parks, gardens and nature preserves along the way. Check out Michigan’s great southwest and have a wonderful trip. No matter where you want to go or what you want to do there, Indian Trails wants to help you make it the perfect trip for everyone. Learn more about our charter bus services and amenities and request a quote today.